Last weekend was a bank holiday here in the UK (which means a public holiday on the Monday for anyone not from round 'ere) and it was actually quite sunny, although not exactly tropical in temperature. Hard to believe now as I sit and write this with the rain pouring down outside. I was super excited last week to be one of a band of bloggers picked as a #MorrisonsMum for the weekend. We were all sent a very generous £80 worth of vouchers and tasked with going to a Morrisons Supermarket to do our normal shop for a bank holiday. I have to admit to never having been to Morrisons before so I was very intrigued to see what it was like. I was especially keen to see what their 'Market Street' bit was all about with fresh veg, bread, butchers and fishmongers. It was also great news to find out that they had just launched their new 'I'm Cheaper' campaign reducing lots of prices instore to every day low prices. I decided to go on Friday afternoon so that left the rest of the weekend free. Bigger Miss was dragged along with me while Little Miss was at a party, although more peaceful it did mean we had a time limit so it did end up as a bit of a rush so the photos aren't quite as good as I would have liked! 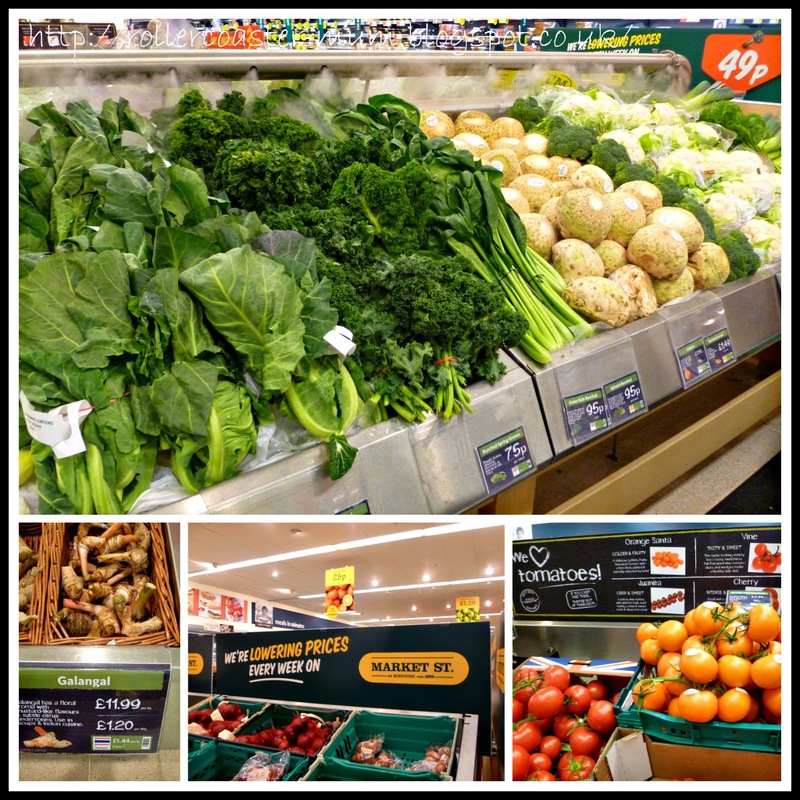 Our first impression was that it was very like some French supermarkets with all the fresh veg laid out - even with those fancy shelves spraying water over them to keep them fresh. I was also very impressed with the choice, not only was there all the basics (many stickered with the new 'I'm Cheaper' slogan) but all sorts of different varieties. I even bought some Galangal (no idea what I am going to use it for but I was intrigued). There were all sorts of tomatoes, potatoes and mushrooms amongst other products and if I was looking for something a bit different for a special recipe Morrisons would definitely be the place to find it. All the Market Street areas were impressive. The fish counter was well stocked and look fabulous and I loved the sign above it! There was a great looking deli, a counter where they would make up fresh pizza to your order and a very friendly butcher as well as an impressive salad bar and lots of delicious looking bread. I purchased some half price Rump Steak (very good value at £7.74/kg) and the butcher was efficient and friendly. He even advised Bigger Miss to fill up her salad bar pot (for her supper) more as we would pay the same whatever we put in it! 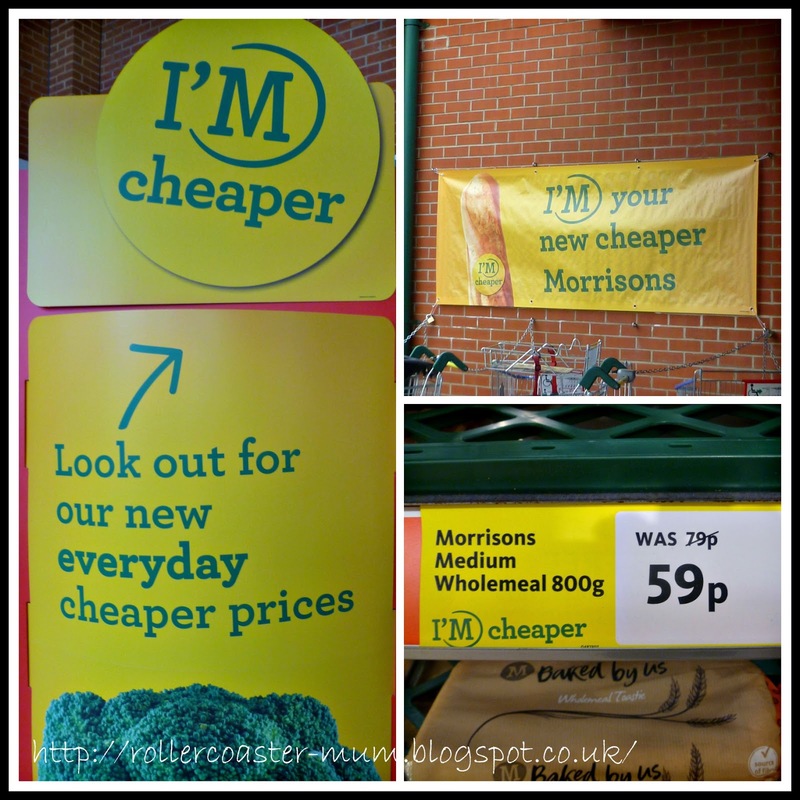 As well as all the Market Street areas, which is what I believe Morrisons is famous for, there were also lots of signs featuring their new 'I'm Cheaper' campaign which started last weekend and features new every day low prices. As far as how they compare with other supermarkets price wise I would say that as with all of them some items are cheaper (like the bread above) and some were a bit more but on average I would say they compared favourably with the other big stores. 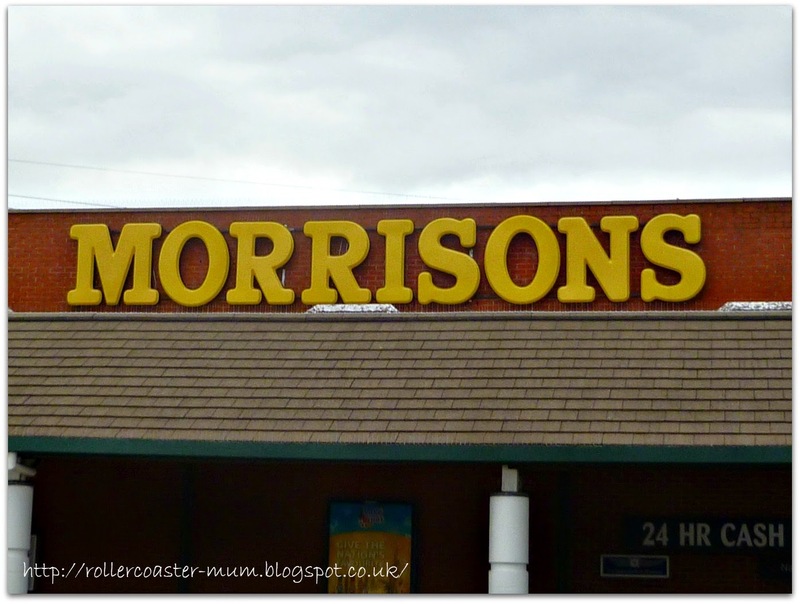 I am sure if you normally shop at Morrisons you would definitely have noticed these signs. As a first time visitor I did but obviously didn't know what it was like before! This was just one of the touches that I liked that I have not noticed in other supermarkets. 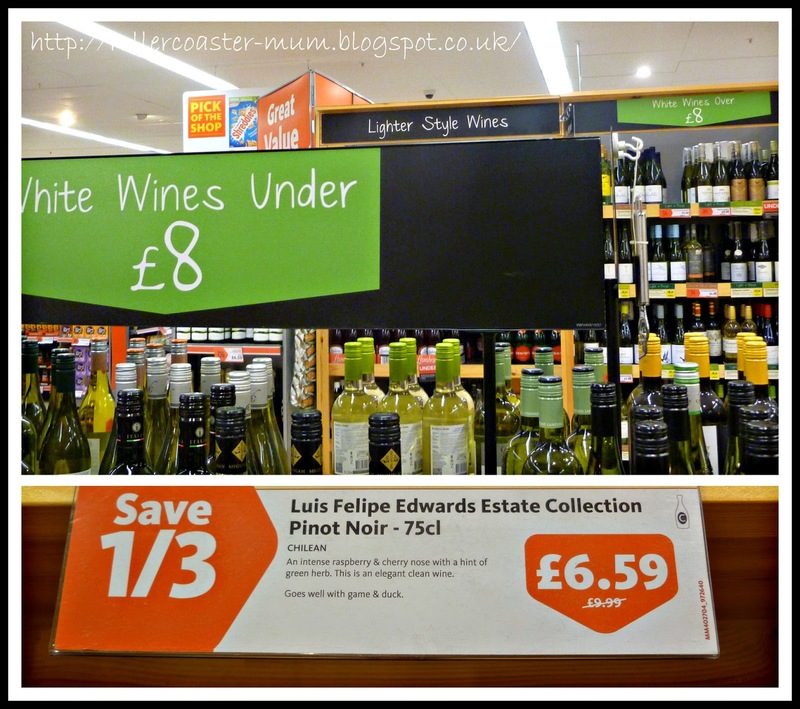 The wine aisle was split into areas of under £8 and over £8 so it was easy to pick out wines without scanning loads that you weren't interested in. I also found this rather nice Pinot Noir in the special offer bins at the end. It was very nice and highly recommended! As usual I had gone shopping without a list and without much of a plan and with those vouchers burning a hole in my pocket I did spend quite a lot but I did get a lot of treats that we wouldn't normally buy such as the steak, a pot of fresh olives, posh loaves of bread, a pack of beers (offer was too good to refuse), some nice ice cream and so on - well it was a bank holiday! Now I had to decide what to cook when I got home. First up was Bigger Miss's supper which as we were late home consisted of yummy Chicken Pie from the Deli (89p) and salad that she had picked from the salad bar (£1.89 for a small pot). I reckon she only ate about a third of the salad, the rest was saved for the next day so the cost of her supper (which she declared delicious) was £1.52 and zero effort from me - result! Optional - 2 x tablespoons mascarpone or cream (from cupboard) and 1 tablespoon pine nuts (toasted) if you have them. Whisk together the olive oil, vinegar and crushed garlic with some salt and pepper, in a small bowl. 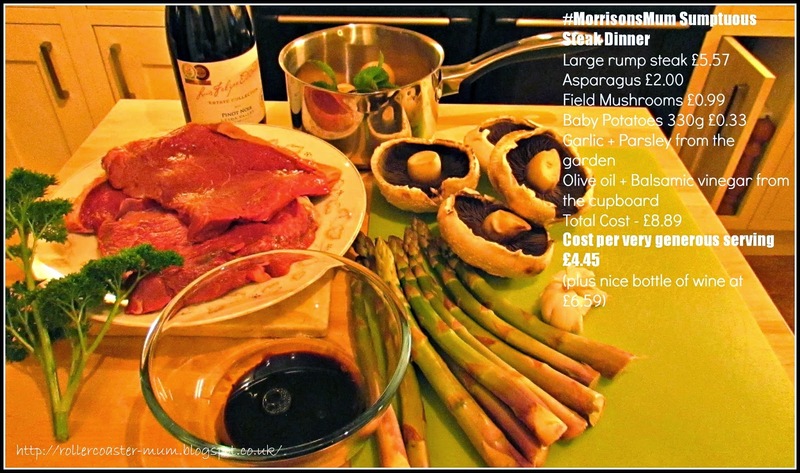 Place the asparagus and mushrooms on a large plate and drizzle with the oil mixture. Set this aside for 10 minutes. Heat the barbecue or grill, or in my case the pan over a high heat. Brush the steak with a little olive oil and sprinkle with salt and pepper. Cook to your liking, turning over once or twice. I cooked ours to about medium and probably cooked them for a couple of minutes each side. Once cooked remove from the pan, cover with foil and keep warm. Add the mushrooms and asparagus to the pan or grill and cook for 3-4 minutes until tender. At this stage I added a couple of tablespoons of mascarpone that we had in the fridge to make a lovely creamy sauce but this is optional. To serve, place the vegetables on the plate, top with the steak and sprinkle with parsley and pine nuts if you have them. 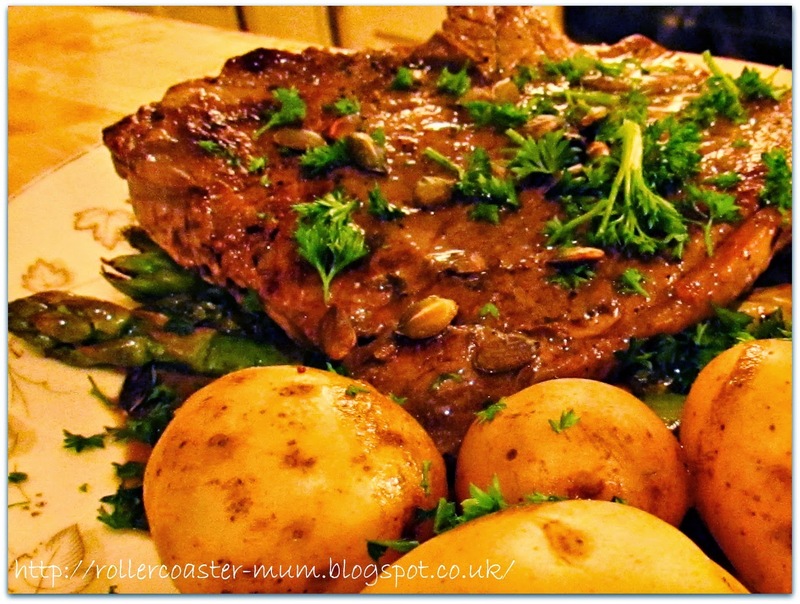 I also served the steaks with a few baby potatoes - just boiled with a sprig of mint (99p for 1kg but I reckon we used about a third). We also had a couple of glasses of the £6.59 Luis Felipe Edwards Estate Pinot Noir and I have to say it was all delicious. The steak was tender and the mushrooms and asparagus super fresh. Although this was not a cheap meal, coming in at £4.45 per serving (including the potatoes but not the wine) it was a real treat and the portions were huge. I could barely move afterwards - we could quite easily have split it with the girls as well I reckon (maybe with a few more of the potatoes) which would have meant a price of about £2.25 per serving. The potatoes by the way were excellent too - really sweet and tasty. Overall we had a fabulous weekend with all the #MorrisonsMum treats. We didn't do a great deal - just chilled out in the garden. The kids played out with their friends - blew a few bubbles, did homework whilst we cleaned out the greenhouse and generally enjoyed being at home together and eating good food. 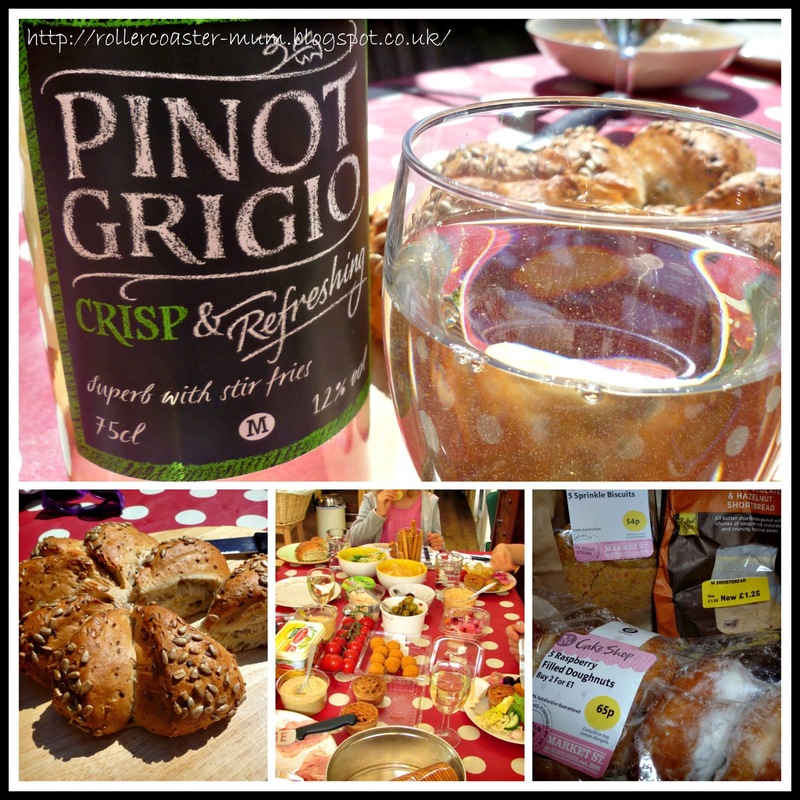 We had barbecues, lunchtime spreads, a cheeky glass of wine, some scrummy sunflower and honey bread and even some sweet treats. Overall I would say Morrisons does represent good value for money but the main reason I would go back is the quality. I wouldn't go every week as our nearest Morrisons is just too far away for a weekly shop but I would definitely visit if I was in the area. Thank you for a great weekend - #MorrisonsMums and BritMums for organising. Disclosure - I was sent £80 worth of Morrisons vouchers in return for this post but I was free to buy and write whatever I liked and all opinions, words and pictures are my own. 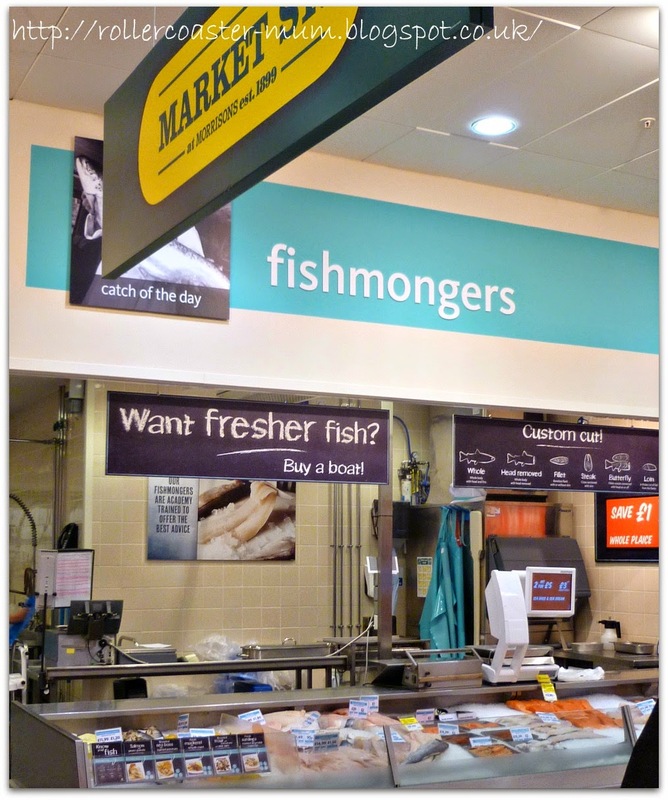 I do like the way Morrisons has the Market St setup and I always used to like their fresh food best. I haven't been to one in about 3 years though! Great post. I used to shop at Morrison's when I lived up north. Those steaks were brilliant value for money! I am craving steak now so will buy some for the weekend! I'm a huge fan of Morrisons and am fortunate enough to live 5 minutes walk from ours in Taunton. I think they really are leading the way with their Market Street as well as all the fresh meat, fish and bread - great food and great value - Love the fishmongers sign! Yummy! The photos are great and you have actually made me want to visit a Morrisons so well done you! I am guessing that was the point in Morrisons giving you the money! ;) You will be making a curry or something with the galangal then! I don't think I even know what it looks like! Hope you have another great weekend like that one! Fabulous photographs! I do all of my shopping at Morrisons - have done for a long time now. Their own brands, i.e. bread, cakes, pastries are delicious, and they have their own farms also which means their meat is good quality. Great photos, that recipe sounds delicious!